Can you spare 30 minutes? Try a Lunchtime Facelift. Most of Dr. Anna’s patients share one commonality: they’re time-poor. Juggling work, family and a household leaves very little ‘me time’, which is why Lunchtime Facelifts are very popular. A Lunchtime FaceLift is a non-invasive procedure aimed at freshening up the face by using a combination of neuromodulators like Xeomin and hyaluronic acid fillers and/or a laser facial. In most cases, the consultation and procedure can be completed within 30 minutes, with little to no downtime. Meet Dr. Anna’s patient; a busy mother and schoolteacher needing a quick pick-me-up. 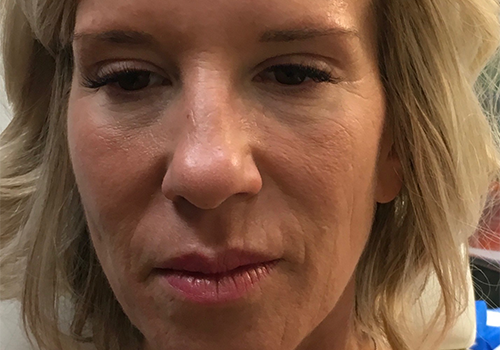 Dr. Anna used Juvederm Voluma to lift the patient’s cheeks and give the appearance of a fuller face. Dr. Anna transformed the patient’s lips with half a milliliter of Juvederm Volbella that smoothed out the surrounding fine lines. The effects of Juvederm can last up to 24 months, and clinical evidence shows that natural collagen production is stimulated with repeated injections. The image shown here is of the patient prior to treatment. 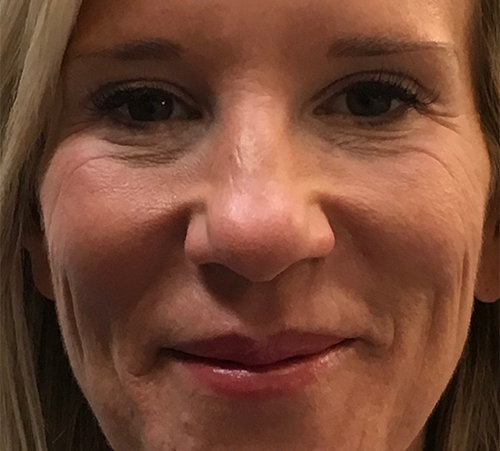 Dr. Anna used Xeomin injections to relax the upper half of the patient’s face including crow’s feet, in-between eye lines (known as 11’s), and forehead lines. Xeomin is a safe and efficient “non-inferior” alternative to Botox, according to studies. Like dermal fillers, Xeomin works with the body’s natural systems. As muscles have memory, repeated Xeomin injections over time actually decrease the severity of wrinkles naturally. The image shown here is of the patient after treatment. Combination therapy is key to achieving the best possible results in the shortest time frame. Combination therapy is the use of neuromodulators, like Xeomin, dermal fillers, and laser treatments—all within the one session. These techniques complement each other and work towards opening up the face and making it appear less tired. Please call 250.590.0883 or visit our online booking system. Discover the clean path to youthful looking skin. Receive valuable information on toxin-free skincare, new products & treatments and special offers exclusive to our subscriber community.